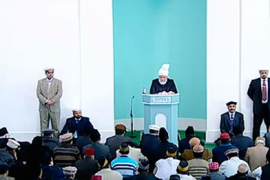 Today’s Friday sermon was delivered by Khalifatul Masih V (May Allah be his Helper) from Baitul Futuh mosque, London. After Tashahhud and Surah Fātiḥah Huzoor preceded that Majlis Ansarullah UK and Lajna Imaillah UK Ijtema is starting from today. The true essence of our Ijtemas is to progress in the relationship with Allah and with another. The spirit of these religious and sport competitions should be with the thought that we have to progress in knowledge and make it a part of our daily lives. There are some sport events too which are essential to be healthy in order to fulfill our duties towards Allah and towards the people. Otherwise, neither it is the age of the Ansar’s to indulge in such sports nor the women of this age have interest in such activities. However, these exercises are important in order to keep oneself in a healthy shape and be conscious about one’s health. And later on must include healthy exercises such as walking in their lifestyles to be active. However, the actual purpose of these Ijtemas is to focus towards our religious and scholastic skills. The Sadar Sahib of Majlis Ansarullah UK requested me to advise the Ansar’s concerning this in the sermon. At the age of an Ansar, a person becomes mature and thus they themselves should be well aware of their responsibilities. Furthermore, they should concentrate and fulfill these responsibilities. Firstly to have a mature age and then secondly the name of the group ‘Ansarullah’ of the group of men who are above the age of 40 years is itself enough to make a realization in them. The responsibilities that these men should fulfill have been summarized in the oath of Ansarullah. Firstly that every man included in this group of Ansarullah should try with his purest heart to make Islam stronger and be a faithful follower of Ahmadiyyat. And in order to try to make Islam stronger cannot merely happen with one’s strength and knowledge. Islam is the religion from Allah and it is a complete religion of teachings. No individual can change the faith or teachings of Islam but one has to reform themselves to form a bond with this faith. And you cannot achieve this without establishing a strong relationship with Allah that every Ahmadi should strive for. The standard of the Ansar in their relationship with Allah and their faith should be the strongest. A true bond with Allah cannot be established until one forms a true relationship with Holy Prophet (Peace be Upon Him) for which Allah has commanded us to convey the Salutations of Peace and invoke blessings upon our Holy Prophet (Peace be Upon Him). Thus it is very important. Then it is to fulfill the rights of the pledge that we have made to the Promised Messiah. When we realize the duty to fulfill these rights that are essential upon us, only then can we become true followers of Ahmadiyyat. In today’s world, Allah has sent the Promised Messiah to spread the message of Islam. Our true attachment to Ahmadiyyat will only be evident when we take part in the spreading the teachings Islam and the word of Ahmadiyyat. Then another pledge Ansarullah members perform is to form a bond of loyalty with Khilafat-e-Ahmadiyya which can only be achieved when the members strive to spread the words and programs of Khilafat and try their best to help in this work. This can only be made possible when Ansaar members will pay great heed to the Khalifa of the time. For this, Allah has blessed us with the MTA through which we can hear the Khalifa despite the long distances. You should also connect your children to the institution of Khilafat along with other spiritual teachings so that the connections of faithfulness to Khilafat are transferred from generation to generation. Also this would help in the propagation of Islam as after the Promised Messiah it has to be taken forward through the institution of Khilafat. Thus for this, keep a look out on every pledge that demands sacrifice. May Allah help you all to achieve these goals. Lajna Imaillah also has a pledge that they should always be aware of! It is indeed a great blessing of Allah that by His grace, majority of the Lajna Ma shaa Allah are following the religion with utmost sincerity. They are strong even when it comes to their beliefs. But every Lajna member and every Ahmadi women should elevate their spirituality as per the commandments of Allah and the Holy Prophet (Peace be Upon Him). Lajna members also have a pledge that they repeat on their functions and programs which states that we are ready for any kind of sacrifice for the sake of our religion. Thus the first sacrifice that the religion demands is that the practical conditions should be according to the code of Islam and they should be preferred over all the worldly desires. An Ahmadi woman should have high standards of truthfulness; she should follow all the commandments associated with it, should be fair in conduct and fulfill important teachings on pardah. If any Ahmadi woman is weak in any of these above mentioned requirements then unfortunately she is not practically living up to her pledge. Therefore, neither the fear of the society nor the self-volition should drive an Ahmadi woman away from her religion. Instead every Ahmadi women’s life should be according to the teachings of Allah. Another important pledge is related to the truthfulness. Every one of us needs to self-audit ourselves as whether we are truly following the commandments or not. Likewise, there is a pledge about the upbringing of children which should be fulfilled with the utmost abilities. The best teaching institution for a child is his/her mother. Thus mothers should work very hard towards it. If all our women or as said by Hazrat Musleh Maud that if 50 per cent of the women ensure righteous up brining of their progeny then this could confirm the protection of the generations and societal reforms. They will be sources of decorating their religion and be the ones who connect to Allah. Likewise it is the duty of the mothers to develop the seed of sacrifice for one’s nation/country in their children. They are also responsible to shape their children’s minds towards all obligations and needs to obey the laws. Also it is essential for them to help their children differentiate between right and wrong and to help them realize about their role towards the country’s development. Also help them connect to the institution of Khilafat. Therefore, every mother should work towards fulfilling her responsibilities and May Allah gives them the strength to do so (Ameen). Like Nasiraat are also having their Ijtema along with Lajna and they should also be fulfilling their pledges. Fourteen to Fifteen years of age is when you can differentiate between good and bad. And even in this age you have a lot of desires and wishes. If one has more focus towards worldly things then they are driven towards them. Therefore, every Ahmadi girl should be very conscious about it. Also there is a need to reemphasize the pledge so that every Ahmadi girl should be concentrating on achieving spiritual goals that are mentioned in their pledge that always be ready to help the religion, country and nation, remaining steadfast to truthfulness, to be ready for any sacrifice required for the institution of Khilafat. Thus if this pledge is made a core part of their lives then our girls will not only secure themselves in this world but will become a source to protect the generations to come. May Allah help them achieve this and make the Ijetma’s very fruitful (Ameen). Now I would take the opportunity to discuss about a beloved one who left us very recently. A few days ago we lost a lovely individual due to a tragedy and now we saw an individual pass away due to sickness. This young man who had almost completed the education of Jami’a and after fighting an illness left us (‘Ina Lilah e Waina Alla-e-Rajeehoon’). The boy whom I am talking about is Mazhar Ahsan Sahib. He had not yet given exam of the final year due to his illness but he through his blessed model proved to be a missionary. Allah had inculcated immense enthusiasm for the service of Islam in him. How he had to adapt himself to the commandments of Allah. Every soul who comes into this world will depart but fortunate are those who strive to reform their lives as per the teachings of God. Everyone associated to him at the Jami’a that includes his class fellows, his friends, his teachers are writing to me and these are not merely customary messages of condolences but I know him personally and that he was a model of sincerity, faithfulness and spiritual actions. May Allah elevate his standards (Ameen). He was the only son of his parents and had two sisters. His mother has shown extra ordinary example of patience and to accept the decree of Allah. May Allah give them the ability to bear this loss. Promised Messiah said that no medicine is as helpful and caressing at time of pain than the trust in Allah. The boy also left this world preaching about patience and tolerance. Sorrow and distress is there but this pain should be molded to prayers for the departed soul that may Allah elevate his standards. The boy suffered from cancer and initially was cured with timely medication. But then he suffered with a chest disease that could not be diagnosed due to which he died ‘Ina Lilah e Waina Alla-e-Rajeehoon’. His great grandfather, Hazrat Misri Nizaam-ud-din Sahib was a companion of the Promised Messiah. His maternal grandfather Chaudhary Mohammad Munawar Ali Khan Sahib and paternal grandfather Haji Mazoor Ahmad Sahib, both belong to Qadian. The boy was a student of Jami’a and was a Moosi. His mother says that he always used to give me suggestions, kept my secrets and was a teacher to me. Apart from this mother son relationship, we shared an exceptional understanding. He was well aware of the things that made me happy and which made me angry. He often used to talk to me about the institution of Khilafat, Jama’at, Nizaam, Khalifa of time, Holy Prophet (Peace be Upon Him) and his companions and the Promised Messiah and loved these topics. If the topics would lead to worldly matters he would say that leave them because we don’t have anything to do with them. It was his wish to attend the Jalsa Salana this year but he realized that it would be difficult for him so he sent his entire family and himself watched the entire coverage at home in Glasgow on MTA. He was used to of doing all his chores himself and he became even softer in his illness and was never annoyed or showed anger. When he recovered from leukemia, he requested Ameer Sahib Scotland to give him Jama’ati work despite the weakness. Thus he had started to work for newsletter and advised all the workers with his valuable suggestions. He also designed the certificates for the Lajna and Nasiraat Ijtema in Scotland. He was a regular reader of Promised Messiah’s books. His mother says that when on September 12th he got the chest infection, he called me to sit next to him and requested me to count Allah’s blessings on my fingers. Doing so I eventually said that there are great favors and they cannot be counted. He said that this is what I am saying; one should remember the countless favors of Allah. His mother says that I did not understand at that time but he was preparing me mentally for this loss. She says that I told Murabi Sahib that Mazhar loves to work for Jama’at and is always making plans about his work after becoming a missionary. When he was diagnosed with cancer in October 2015, he advised his sister to tell his mother with much precaution as he couldn’t see her cry. He would offer prayers, recite Holy Quran and watch the Friday sermons regularly at the hospital. He would listen to the nazams and watch Jama’ati pictures online. He would always preach the doctors and nurses about peace conferences, Jalsa’s and other Jama’ati activities. He asked his class fellows to send him the minutes of the missionaries meeting after the Jalsa Salana. He loved Khilafat and his mother says that for the first time I saw him crying so intensely after hearing about the demise of Raza Sahib. Also he was concerned about the sadness that would have inflicted Raza’s parents and the Khalifa of the time. She says that we are satisfied by Allah’s decisions. It is indeed His will, He knows better and our duty is to pray. She says that Mazhar reformed us while leaving. His mother says that on September 13th (Eid day) he suffered severe coughing and asked me to make green tea. When I went to him I realized that he had very high fever. Ambulance was called and upon leaving he told me that you all go to offer Eid prayer as there is not a need to accompany me to the hospital. I will call you in some time and I will also listen to the Eid sermon on my phone in the hospital. He had a very nice voice so his sister had recorded azan in his voice and used it as an alarm to wake up for Fajr prayer. His mother says that when he was in his last breaths, the Azaan in his voice started ringing. This made them even more emotional but it was the decree of Allah. His sister’s bone marrow matched with his and he underwent the treatment. The doctors too were surprised who initially thought it was not possible. During chemotherapy he constantly preached the doctors. He had firm faith in Allah and used to say that Allah will not waste him. May Allah be fulfilling his wishes in the world hereafter (Ameen). Doctor Hafeez Sahib says that when I went to meet Mazhar at Glasgow after he was diagnosed with cancer, I found that he had perfect trust in God. His mother told him that Mazhar always asked them to be grateful for Allah’s blessings. Benazir Rafay Sahiba from Glasgow says that I belong to Sri Lanka and I am good friends with Mazhar’s mother and sisters. When she went to see Mazhar at the hospital, he very patiently told them about his illness. When he initially recovered from it, he participated in a 5 Km charity walk and claimed to have done it very easily. Hafiz Fazl-e-Rabi Sahib says that he was very much interested in learning Quran and recited the verses in a very beautiful and soothing voice. Even before joining Jami’a, he travelled regularly from Glasgow to London along with his family to participate in Ahsan Taleem ul Quran class. He says that Mazhar had to travel back to Glasgow every 2 weeks due to immigration issues and when I inquired that it would be hard to commute such long distance very frequently so he answered that these small problems do not matter when one is aiming to achieve something so important and spiritual. Waseem Fazal Sahib, a teacher at Jami’a exclaims about Mazhar that he was a very courageous, serious, respectful student with a very consistent character. He was included in those few students who took their responsibilities very seriously and fulfilled them with utmost love. He was very good at arranging Jama’ati activities. He also served as a ‘prefect’ at the Jami’a hostel for many years. At one time when an important work was handed over to him, someone enquired if Mazhar will be able to accomplish the outcomes of this work. Upon this, one of his teachers said that after handling over work to him, we have to hide from Mazhar as he takes it with so much responsibility, seriousness and consistency. A few years ago at the annual sports event of Jami’a, he was required to work at the department of hospitality. At the final day, many guests show up so Mazhar involved himself in work throughout the night and did not take rest for even a moment. The next day he showed the same enthusiasm for work and after the event he wrote a very comprehensive report which is in record till today and has proved to be very helpful. Hafiz Mashoor Sahib says that a few days ago when I talked to Mazhar on phone so he expressed that after gaining recovery from the illness, he wants to serve as a missionary. And now that his treatment is undertaken he is serving his local Jama’at. Malik Akram Sahib (Murabi Jama’at Glasgow) said that the day Mazhar’s family shifted to UK from Dubai, we had an event at the mosque. The entire family attended the event and Mazhar went to the kitchen and started helping the team right away. Starting from the day he came till the day he joined Jami’a he has helped the local Jama’at and the mosque to the best of his abilities. He was a very quiet, refined, exquisite, clean person who would never waste his time in meaningless talk. He knew the value of time and used it very properly. He possessed an excellent character and was a very soft spoken person. He respected everyone and it was his utmost desire that his sacrifice be accepted and he be able to become a missionary after completing the required education at Jami’a. The day he got admitted into Jami’a, he was so happy that as if he had received universal blessings. He had great love and respect for Khilafat. Arshad Mehmood Sahib (Quaid Glasgow) writes that he used to participate in all the competitions. We used to arrange the Ijtema’s and other functions at a locality away from the main city so it required loads of work before the events. Mazhar despite being a young boy would always be up for any kind of work. He was very courageous and it is evident from this incident. Once there was a competition of extempore speech and the topic was very difficult. Mazhar took part in it and the Khuddam started laughing upon hearing his speech but he completed his speech and did not lose his confidence. In fact said that if we don’t take part we will not get over our shyness and Khuddam should be serious during the speech competitions. Abdul Rehman (Ghambian missionary who passed out from Jami’a last year) says that during the Jami’a he spent time with Mazhar. After passing out we kept in contact through watsapp. He shared one of the messages Mazhar sent him after he was diagnosed with cancer. He wrote “Although I am undergoing through this illness but instead Allah has blessed me with a lot of things therefore I should thank Him abundantly and thus I don’t consider it difficult to pass through this pain”. Also that “I am not thinking about my illness instead I am thinking about how can I serve Jama’at in the best possible manner”. Sheikh Samar (one of his class fellow) says that he was always smiling and would keep people happy. He would treat everyone equally and would not let any friend feel that he was less important to him. He never indulged in any kind of fight and was a very big hearted person. He would never let go off any preaching opportunity. At the hospital too he was known to be the Muslim who preaches everyone around. No one has ever been inflicted by pain due to him. He never exclaimed bad stuff about anyone. He would help everyone as much as he could and would take care of even the minutest of things. He would love everyone. Sahir Mehmood (Murabi and his class fellow) says that I am honored to have spent seven years with such a noble person. He possessed plentiful qualities. He was a very hospitable, humble, modest, positive thinker and was very honest to his work. He was a prefect during the early years at Jami’a and would advise his fellow students to sleep on time and to clean their rooms, would wake up others for prayers and would settle arguments if any. The fellow students would enjoy teasing him. Sahir sahib says that once i did some mistake upon which i was scolded by Mazhar Sahib. But soon after he came to me and apologized and started crying. Thus he was a very soft hearted person. He says that whenever I fell sick and would stay late in bed on a day off, so he would come and put breakfast near my bed. If I would catch a cold he would treat me with warm honey water. He would very interestingly mention about his meetings with Huzoor. In short, he was a very open hearted, faithful, sincere, humble, saint, modest, hard worker and a true follower of Islam. Another good quality he possessed was that whatever he liked for himself he would choose the same for his friends. He would always bring stuff to eat for his friends. He lived a very simple life and was never seen spending extravagantly. He paid great heed to cleanliness and would offer Tahajud regularly. His friends said that many a times I saw him offering supererogatory prayer during night time. He would very habitually keep fast every week. He would give charity and was very organized. Apart from Jami’a education he would recite Holy Quran and read religious books every day. No matter what the weather would be, he would routinely exercise. He used to read newspaper, take a nap and would write dairy every day before sleeping. He would regularly take notes of Friday Sermon and would discuss it with his friends. He was a true devotee of Khilafat and would never hear anything against it. He would be up for every new initiative. He considered himself a soldier of the Khalifa of time and was always ready to sacrifice his life for Khilafat. He did not merely say it through words but his body language would reflect the emotional attachment. After being diagnosed with Cancer he comforted his fellows and asked them to have faith in Allah. He accepted his illness as a trial from Allah and never expressed any sort of worry or distress in front of anyone. One of his friends Sharjeel Sahib writes that he had a great personality and was a very beloved friend. He possessed abundant qualities. He was very caring and always trusted in Allah’s plans. He was a true devotee of Islam who would sacrifice anything for it. He would never hurt or bring any distress to anyone and was always found smiling. He would never get angry or indulge in irrelevant conversation. I have never seen him talk ill or back bite about anyone. He would do every work with utmost patience, optimism and urge. He never considered any work small and would help everyone. He did not show any laziness and was a very strong willed person. He had great attachment to Jami’a. He did not lose hope despite immense struggle and fought his illness very bravely. He never made fun of any body and would even stop others from doing it. He was blessed with the qualities that are present in a missionary. He was very God fearing. He would take care of very minor things such as never used his trimmer (as it was aloud) while others were sleeping. He was not a double faced person, was regular about following Quranic teachings and would make notes of Quranic translations due to which his translation of Quran was extraordinary. Aafaq Sahib who got admitted into Jami’a after moving from Pakistan says that people came to meet me when I moved. He says Mazhar Sahib also came to meet me and after some time he came back again with a pillow and sleeping mat. He says that our entire class went to Glasgow to meet Mazhar sahib so he seemed very happy. He had arranged for a feast for all of us and was adamant that we all eat well. He was a gentleman who understood the essence of sacrifice. Although he passed away at a very young age of 26 years but whenever he got a chance he taught his friends, preached Islam in a very open manner. He had some preaching material pasted at the front wall of his room so the staff visiting him could read it. Huzoor says that whenever he had a chance to talk to Mazhar Sahib on phone he seemed to be very composed. His mother said that due to medicine intake his mouth had developed ulcers but whenever he talked to Huzoor it was very clear. He was a very loyal and dedicated person who understood the reason for his creation. May Allah always shower His blessings on him (Ameen), exalt his standard and give him place among His beloveds (Ameen). May Allah give us more devotees like him who understand their responsibilities diligently (Ameen). Pray especially for his family that May Allah give them the patience to bear this loss (Ameen). After the Friday prayer, Hazoor led the funeral prayer of Mazhar Ahsan Sahib.